This is the much awaited first release of the new ONEstar! Taking shape guidance from their highly acclaimed ProtoStar and mixing it with the price point of the ONE this is a winner. Plastic play at its finest. You will not find a plastic yo-yo at this price with such a solid play and feel. Completely unresponsive and nimble in the air its the plastic yo-yo you have always wanted to carry with you everywhere. Built from the stuff champions are made of. Using the popular shape of the Protostar and the unbelievably durable material of the ONE, the ONEstar is pure performance at a budget price. Pick up this throw and you won't be disappointed. 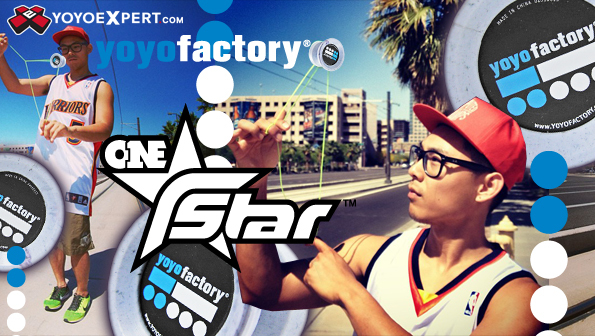 It is sure to be an all time favorite and is the perfect yo-yo for the new player looking to learn advanced play fast!